Please note: Unfortunately we can't personalise these packs with your own images. These packs are pre-printed with a broad range of images to help you select printing papers. 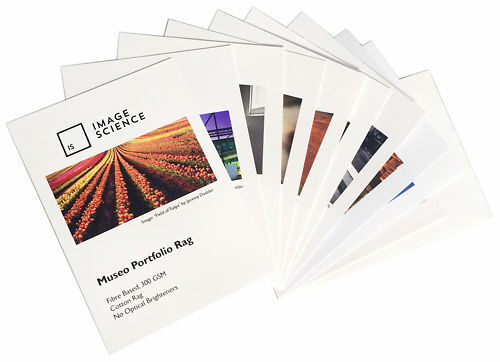 Our Image Science Printing Service Paper Sample Pack makes choosing the right paper for your prints even easier, especially when interstate and ordering online. Each pack comes with a printed sample of our 11 most popular papers and a coupon code to redeem for $10 off your next printing order to get you started! We will also ship it out to you at no cost - so in effect this packs becomes free! (N.b. Coupon code valid only once per customer (even if you purchase multiple sample packs), and the coupon code can only be used for a discount on fine art print services specifically). NB: This is NOT a paper sample pack for papers for doing your own printing - it's a sample pack of the papers we print on for our printing service here at Image Science. Note precise contents may vary if there are issues with paper availability but we try very hard to keep the above list current.